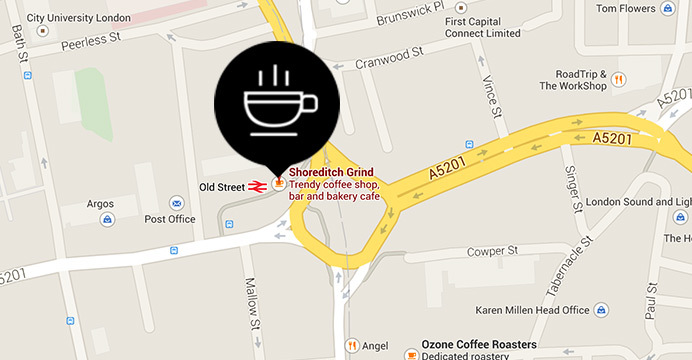 Great places to work from: Shoreditch Grind. Shoreditch Grind is in the heart of the tech startup scene with a great location (literally 7 seconds from Old Street Tube) and striking view of Silicon Roundabout. Don’t expect a quiet and casual place with comfy couches. It breathes a contemporary hip atmosphere with staff equally as trendy and mostly good coffee. It’s a great place to work for an hour or two, if you thrive in a relatively loud (music, acoustics) environment. It’s like working in a greenhouse with cool people and good coffee. The place is largely made up of wooden furniture and a coffee bar behind large windows. The furniture adds to the trendy flavour but is is not that great to sit on for long. In the evening ‘The Grind’ turns into a cozy cocktail/drink place. The WiFi is generally good for normal working purposes. It says you can only use it for 45 mins, however just login again if your time runs out. There are charging sockets along the windows sides. As mentioned, the place can be a bit loud. If you don’t mind it, or are happy to work with your head between Beats headphones, it’s a great place to hangout with your mac for an hour or two. 7/10. The cappuccino and flat white are often made competently. On the verge of warm enough (although an Italian would completely agree with the equality of temperature of coffee and foam). Sometimes the coffee lacks a bit of flavour. They have a small selection of good sandwiches, baked goods (yummy!) and often salad for lunch. Exit 8 from Old St. Tube. Newer PostLearn from others: advice on marketing. Older PostAre you paying over the top for your mobile?